Although you may do many routine check-ups on your equipment, do you stop and think about your air conditioning system and what you are doing to help keep this system running properly? 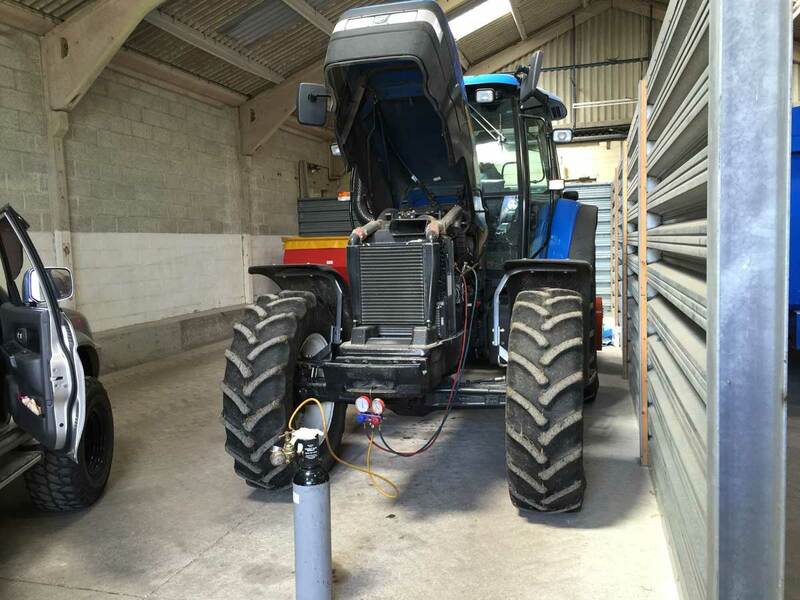 Although it is now considered a standard in the automobile industry, in the agricultural industry air conditioning is still a luxury that often affects the comfort of equipment operators. When we first think of air conditioning, we automatically just think of comfort. However, it also plays a role in safety because it helps people not feel as tired and fatigued when driving vehicles or operating machinery. All in all, the purpose of the air conditioner is to provide cool dry air by removing the moisture or humidity and the heat energy from the air inside the cab of vehicles, which happens through a heat transfer cycle. So, how does an AC system work? In short, the heat energy from the air in the cab is transferred to the refrigerant, causing it to become a gas. The refrigerant goes through a series of changes from gas to liquid, back to gas as it cycles through the system. After it leaves the evaporator, the refrigerant, in gas form, goes through the compressor, also known as the heart of the system. It then goes through the condenser, which cools the refrigerant and changes it back to a liquid. The cooled refrigerant flows through the orifice tube, returns to the evaporator as a cooled liquid, and then goes to the reciver dryer. When it gets to the reciver dryer it is a low-pressure, high-heat gas. Finally, the fan blows the cooled dry air as a heat transfer item from the refrigerant to the cab. These summarized steps provide a basic explanation as to how the AC system works. However, the overall process is more extensive. In the past, vehicles often ran into the problem of the air conditioning system getting too cold, which would cause the system to freeze up. A constant airflow would have to be kept, which meant keeping the fan on at all times. Today, however, most vehicles are designed to where you can’t even turn the fan completely off. You can only adjust the fan speed. When you turn the air conditioner on, the fans are already automatically running. Early air conditioners would freeze up because people were able to turn the fan down or off when they got cold, but didn’t turn the temperature control level. Refrigerants used in vehicles have also changed. The old air conditioning systems used R-12 refrigerant, whereas new systems now use R-134a. is not as efficient and it raised the operating pressures of the systems. Either way, it still does the job and is an environmentally safer refrigerant. By lowering the amount of gas now used , some system components like the condensers and evaporators have to work harder and more efficiently. AC systems today have to operate under a higher load. The belts and compressors are going to work harder, and pressures working inside the system are going to be a little higher. Also, if a loader, combine or tractor runs a lot of hours, it isn’t uncommon to have AC maintenance work done every year. Now, what are the enemies of air conditioning? There are several factors that can create complications within air conditioning systems. The biggest one is dirt. If you have equipment running out in the fields, there is ample opportunity for dirt and dust to clog up the condensers and other parts of the system. Other factors that can harm your air conditioning systems are vibrations, moisture and hay and forage debris. These things can wreak havoc by plugging up the external portions of your systems. If you don’t monitor this, it could end up turning into a high-cost fix. The air conditioning system as a whole is a sealed system. It operates under its own environment. The refrigerants inside the system are part of this environment. There really isn’t any rocket science here. It is just a system sealed internally that is controlled by heat and pressures. In conclusion, air conditioning is an item that people usually expect, even in the agriculture industry. You can’t hardly handle sitting in a combine, loader or a tractor with all that glass surrounding the cab any more.